It reported in 2008 that CBCT can be applied for visualizing and measuring soft tissues of the dentogingival unit. In 2009, it was reported that CBCT can also be used for assessing and measuring palatal masticatory mucosa. But there is limited knowledge of individual thickness and regional differences of the palatal mucosa. So, the aim of this study was to apply a novel noninvasive method to obtain high-quality images by CBCT that consistently allowed the determination of the dimensions of palatal masticatory mucosa. Twenty systemically healthy subjects (10 males, 10 females), ages ranging from 19 to 53 years (mean age of 32 years) requiring palatal surgery were selected from the Department of Periodontics, Government Dental College and Hospital, Srinagar for the study. Informed written consent of subjects and ethical committee clearance was obtained prior to commencement of the study. Inclusion criteria for the selection of subjects for the study were the presence of all maxillary teeth, except third molars. Subject exclusion criteria were history of palatal surgery, history of presence of pathology in the area being investigated and pregnancy. 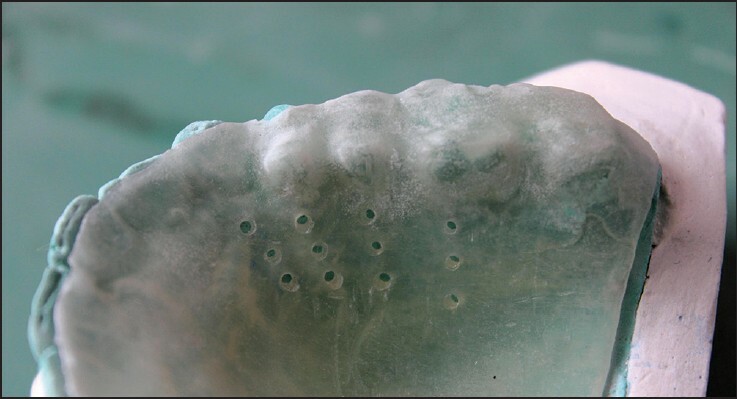 After the subject was deemed eligible, a maxillary impression was made with alginate impression material and poured in a Type III dental stone. Acrylic measurement guides (Clear Splint Biocryl, 0.5 mm thickness were then fabricated on the cast model and trimmed appropriately to include all teeth present in the arch. Using a standardized UNC-15 probe (Hu-Friedy), measurements were made at distances of 2 mm, 5 mm, and 8 mm from the mid-palatal point of the gingival margin for the canine, first and second premolars, and the first molar on both the sides. A hole was subsequently punctured through the acrylic stent at each measurement point [Figure 1]. Gutta-percha was used to fill each measurement site [Figure 2]. The purpose of the gutta-percha was to have a radio-opaque marker on the CBCT scan. This stent was subsequently used for all radiographic measurements. All subjects wore the CBCT stent during the CBCT scan. During CBCT scans, patients were seated and had their heads and chins stabilized. Each patient was asked to bite a wooden spatula placed across a mouth at the level of the maxillary and mandibular molars (first and second molars) to prevent the tongue from touching the soft and hard palates during image acquisition. Together with the wooden spatula, a plasic lip retractor was placed in the patient's mouth so that the cheeks did not touch the facial aspects of the teeth, thus also allowing the facial gingiva to be visible. A scan of the maxilla was taken using the CBCT unit (New Tom Giano, Qr S.R.L.,20-Verona Genoa, Liguria-37135, Italy) by a trained technician at 110 KVp and 15 mA for 36 s (voxel size: 0.25 mm; grayscale: 12 bis). The reconstructed images were generated using a computer software package (Keystone Easy Guide, Keystone Dental, Inc., Burlington, MA). 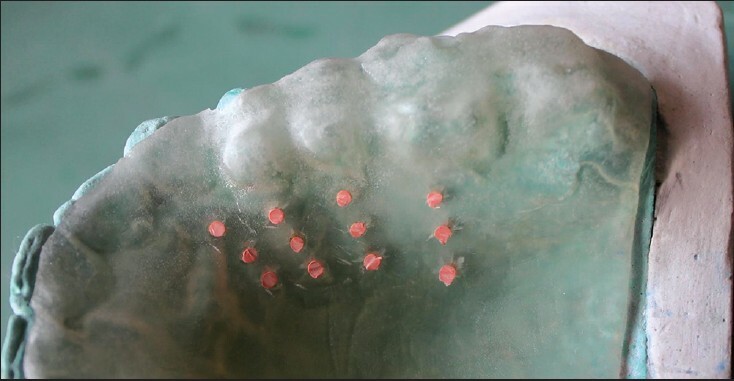 Each gutta-percha point was visualized using a sagittal view and measurements of the soft tissue thickness were made at each point by one investigator and recorded. All measurements were made perpendicular to the palatal soft tissue. Twenty-four total radiographic measurements were taken on each scan (for canine, first and second premolars and first molar at the distances of 2 mm, 5 mm and 8 mm from gingival margin on both right and left sides of the maxilla). Data were analyzed with the help of means and standard deviations. For inter-group analysis, t-test was applied. ANOVA test was used for intra-group analysis. P < 0.05 was considered as statistically significant. [Figure 3] and [Figure 4] show the representative CBCT images of the measurements performed at the distance of 5 mm and 8 mm from the gingival margin in case of the first premolar. 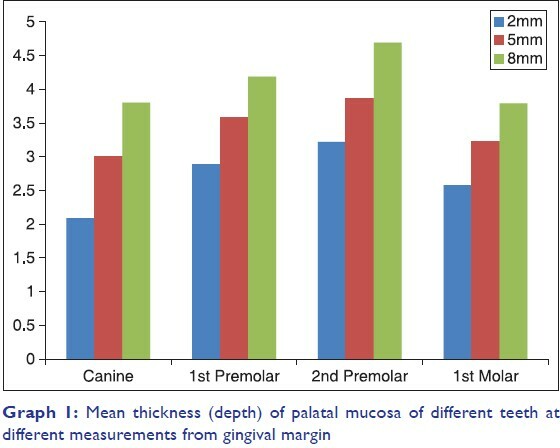 [Table 1] shows the mean thickness with standard deviations of the palatal mucosa (right and left sides) in different teeth, at different heights of the measurement in male and female subjects. The thickness of the soft tissue, as estimated by the statistical analysis, was influenced by palatal location. Both the distance from the tooth and the tooth type were significantly related to the depth (P < 0.001). The tissue became thicker as the distance from the tooth increased [Table 1] and [Graph 1]. [Additional file 1] In all the teeth, the palatal mucosa was thicker at 8 mm when compared with those closer to the gingival margin (2 and 5 mm). Also, the tissue measured at the premolars was thicker than that measured at the molar or canine areas [Table 2]. No, statistically significant difference was found between male and female subjects. Also, the measurements were similar on both the sides (right and left sides). There was a tendency for thicker masticatory mucosa to be found in older subjects (above 40 years old) when compared to younger patients (below 40 years old). Successful surgery depends on several factors, such as a sufficient blood supply to the graft, minimal damage at the donor site and the patient comfort after the surgery. These factors require the anatomical knowledge of the palatal mucosa and the greater palatine artery, which supplies the palatal gingiva with blood for the determination of the optimal treatment plan and prognosis. Over the past two decades, the use of CBCT for imaging of the maxillofacial region has increased dramatically. 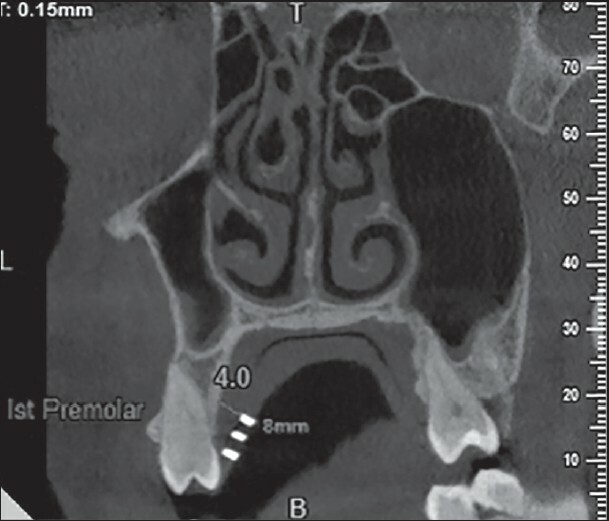 This study describes a noninvasive technique based on CBCT, which consistently produces images that allow the measurement of the dimensions of the palatal masticatory mucosa. The gingiva and the mucosa of the hard palate are two distinct soft tissues and together they represent the masticatory mucosa. There is considerable intra-individual and inter-individual variation in the thickness of this mucosa. Thin (<0.05 mm) or intermediate (0.05-0.75 mm) thickness grafts are used for increasing the width of attached gingiva and thick (0.75-1.25 mm) or full thickness (>1.25 mm) grafts are used for ridge augmentations and root coverage procedures. Grafts with thickness 1.25-2 mm are thick enough to sustain themselves over avascular root surfaces while thinning without splitting until the plasmatic diffusion can be effective. They have greater primary contraction owing to a large amount of elastic fibres but minimal secondary contraction because of thicker lamina propria. The CBCT technique presented here is certainly an excellent tool to determine the location from where a soft tissue graft may be harvested, thus enabling more accurate treatment planning of procedures prior to the surgical appointment. The technique described in the present study reveals a high-quality image of the hard (teeth and bone), and soft (facial and palatal gingiva) tissues and allows measurements of the dimensions and relationships of these structures. A clear visualization of the palatal mucosa is evident in the images, and precise measurement of its thickness can be performed. Furthermore, because the aspect ratio of the images obtained by CBCT is 1:1 and these images can be saved and printed, repeated measurements can be performed either on a computer screen or on hard copies. , It is important to mention here that this is a quantitative and not a qualitative method because the differences between the epithelium, fat and connective tissues cannot be seen on the images. In the present study, measurements were made at the distances of 2 mm, 5 mm, and 8 mm from the mid-palatal point of the gingival margin for the canine, first and second premolars, and the first molar on both the sides. Free gingival grafting and subepithelial connective tissue grafting involves the use of a horizontal incision, perpendicular to the underlying bone surface which is made approximately 2-3 mm apical to the soft tissue gingival margin. According to a study conducted by Ramesh et al. in 2014,  the most appropriate donor site for carrying out grafting procedures is distal canine to mid-palatal aspect of first molar area with a minimum height of 5 mm to 8 mm in the premolar area in all cases. Keeping in view all these facts and observations, these points (2 mm, 5 mm and 8 mm) were selected for measurement of palatal mucosal thickness. Since the palatal mucosa is widely used as an autologous donor graft material, there is growing interest in the determination of the anatomical location of greater palatine neurovascular bundle which is the most important structure associated with the palatal mucosa. According to a study conducted by Cho et al.,  the greater palatine artery is located 10.72 mm from the alveolar crest and 4.38 mm from the surface of the palatal mucosa in the palatal region between the first premolar and the first molar. Therefore, the free gingival graft and the connective tissue grafts at approximately 8 mm from the alveolar crest could be a suitable donor site during subepithelial connective tissue grafting that involves taking a dense wedge-shaped piece of connective tissue. Thus, CBCT being a noninvasive reliable method that accurately and consistently provides the thickness of the palatal mucosa at different locations on the palate may prevent any damage to this greater palatine neurovascular bundle during the surgical procedure. Cone-beam computerized tomography can be used as a noninvasive method to accurately and consistently determine the soft tissue thickness of the palatal masticatory mucosa at different locations on the palate. This reliable, simple and reproducible method could provide important benefits in planning dental procedures, especially in periodontics, implant dentistry and oral surgery. Further studies on the use of this technique for other applications for soft tissue visualization must be performed. Barriviera M, Duarte WR, Januário AL, Faber J, Bezerra AC. A new method to assess and measure palatal masticatory mucosa by cone-beam computerized tomography. J Clin Periodontol 2009;36:564-8. Wara-aswapati N, Pitiphat W, Chandrapho N, Rattanayatikul C, Karimbux N. Thickness of palatal masticatory mucosa associated with age. J Periodontol 2001;72:1407-12. Muller HP, Schaller N, Eger T, Heinecke A. Thickness of masticatory mucosa. J Clin Periodontol 2000;27:431-6. Kau CH, Bozic M, English J, Lee R, Bussa H, Ellis RK. Cone-beam computed tomography of the maxillofacial region - an update. Int J Med Robot 2009;5:366-80. Mah J, Hatcher D. Current status and future needs in craniofacial imaging. Orthod Craniofac Res 2003;6 Suppl 1:10-6. Mah JK, Danforth RA, Bumann A, Hatcher D. Radiation absorbed in maxillofacial imaging with a new dental computed tomography device. Oral Surg Oral Med Oral Pathol Oral Radiol Endod 2003;96:508-13. Januário AL, Barriviera M, Duarte WR. Soft tissue cone-beam computed tomography: A novel method for the measurement of gingival tissue and the dimensions of the dentogingival unit. J Esthet Restor Dent 2008;20:366-73. Song JE, Um YJ, Kim CS, Choi SH, Cho KS, Kim CK, et al. Thickness of posterior palatal masticatory mucosa: The use of computerized tomography. J Periodontol 2008;79:406-12. Kydd WL, Daly CH, Wheeler JB 3 rd . The thickness measurement of masticatory mucosa in vivo. Int Dent J 1971;21:430-41. Ramesh KS, Swetha N, Krishnan V, Mythili R, Alla RK, Manikandan D. Assessment of thickness of palatal masticatory mucosa and maximum graft dimensions at palatal vault associated with age and gender: A clinical study. J Clin Diagn Res 2014;8:ZC09-13. Cho KH, Yu SK, Lee MH, Lee DS, Kim HJ. Histological assessment of the palatal mucosa and greater palatine artery with reference to subepithelial connective tissue grafting. Anat Cell Biol 2013;46:171-6.